Is there a better alternative to Tex-Edit Plus? Is Tex-Edit Plus really the best app in Editors category? Will Tex-Edit Plus work good on macOS 10.13.4? 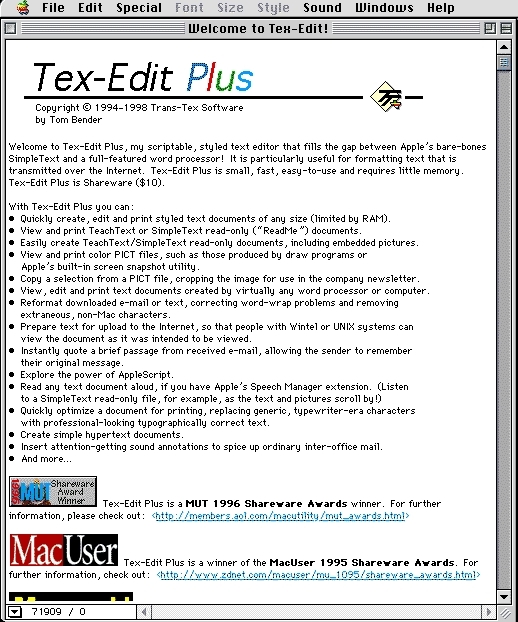 Tex-Edit Plus is a styled text editor that nicely accommodates users who require a little more than SimpleText can offer, without having to use a full-fledged word processor. It's fast, efficient, and has a clean, uncluttered interface. Users will also find it handy for cleaning up text received over the Internet. Fixed a couple of small bugs including one involving the Paste Style command. Page numbers are not printed when printing a single page document. Tex-Edit Plus needs a rating. Be the first to rate this app and get the discussion started!